Hipparchus was a Greek astronomer and mathematician. He used trigonometry to calculate how far away the moon was from the earth. And he worked on the problem of whether the earth went around the sun or the sun went around the earth. Hipparchus was born about 190 BC in Nicaea (now in Turkey), but he did most of his work on the island of Rhodes. At this time, Rhodes was an independent and rich country, even though it was mostly under the power of the Roman Empire. Hipparchus started from the work of Aristarchus. Aristarchus had proposed around 250 BC that the earth went around the sun. Perhaps as part of his work on parallax, Hipparchus made a catalogue of the locations of hundreds of visible stars. Like Aristarchus, Hipparchus started out trying to use Euclid‘s geometry to figure out the movements of the earth, the moon, and the sun. But around 150 BC, Hipparchus realized that Euclid’s geometry was meant for things that stood still. It didn’t work well for things like the earth, the moon, and the sun that moved through space. Hipparchus began to develop a mathematical system that would work for moving objects. We call this system trigonometry, which means “measuring triangles”, but it’s really a system for measuring changes in the size of triangles. Hipparchus combined the Pythagorean Theorem and some of Archimedes‘ work to calculate lists of sines and cosines. For the same reason, Hipparchus may have been behind the construction of the Antikythera Mechanism built in Rhodes about this time. 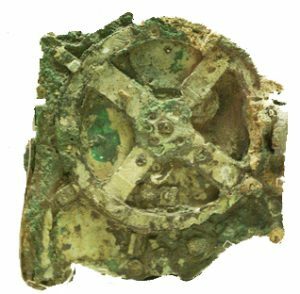 It’s a clockwork machine that moves parts around when you turn the gears in order to predict eclipses (Archaeologists found it on a shipwreck). Despite Aristarchus’ work, though, Antikythera Mechanism is not a model where the earth goes around the sun. In this machine, the earth stands still, and the moon and sun and planets have to move in very complicated ways, including backwards sometimes, in order to make them appear to match reality. Tiny writing on the machine seems to show that people used machines like this to figure out astrological horoscopes. Nobody knows whether Hipparchus was also the first to turn trigonometry around in space to make three-dimensional calculations. But it seems likely that he was, since he wanted to use trigonometry in space. The Librarian Who Measured the Earth, by Kathryn Lasky (1994). An account of the life and work of Eratosthenes, who figured out the circumference of the earth. Explains how he did it. Easy reading. The Shining Stars: Greek Legends of the Zodiac, by Ghislaine Vautier, Kenneth McLeish and Jacqueline Bezencon (reprinted 1989). A Greek myth for each star sign, with drawings of the constellations so you can find them in the sky. Easy reading. Greek Astronomy, by Thomas Heath (1932). A collection of what ancient Greek writers had to say about astronomy, in their own words, with a long introduction. For adults. The History & Practice of Ancient Astronomy, by James Evans (1998). Includes both the history, and directions to actually re-do the experiments that ancient Greek astronomers used to figure out their conclusions. For adults. Greek Science After Aristotle, by G. E. R. Lloyd (1975). Cite this page: Carr, K.E. Who was Hipparchus? Greek astronomy. Quatr.us Study Guides, July 18, 2017. Web. April 21, 2019.